CARBONDALE, Ill. — Six fiction writers, poets and essayists highlight the 11th annual Little Grassy Literary Festival at Southern Illinois University Carbondale. The festival features three days of free activities, set for April 10-12. 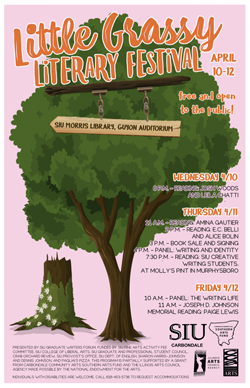 Hosted by the graduate students from SIU’s MFA creative writing program, the festival provides an opportunity for students and community members to hear from renowned literary authors. This year’s writers span a variety of genres and cover everything from science fiction to poetry about race and religion in America, Mary Ardery, a second-year MFA student and co-director of this year’s festival, explained. Amina Gautier, with short story collections “The Loss of All Lost Things,” “Now We Will Be Happy,” and “At-Risk,” received honors as the USA Best Book Award in African American Fiction, and will present on April 11. The festival concludes on April 12 with poet Paige Lewis reading from their forthcoming book “Space Struck,” as this year’s Joseph D. John Memorial Author. Spread across three days, the festival offers a variety of free events open to the public. Activities set to take place at Morris Library’s Guyon Auditorium, with one reading at Molly’s Pint in Murphysboro. 6 p.m. Reading with Josh Woods and Leila Chatti. 11 a.m. Reading with Amina Gautier. 2 p.m. Reading with E.C. Belli and Alice Bolin. 3 p.m. Book sale and signing. 7:30 p.m. Reading with SIU creative writing students at Molly’s Pint. 11 a.m. Joseph D. Johnson Memorial Readings with Paige Lewis. For more information, contact Mary Ardery, 2019 Little Grassy Literary Festival co-director.